In Memoriam: Sir John Hurt | Warped Factor - Words in the Key of Geek. Hamlet, Act V Scene I.
Potterheads, raise your wands once again. Whovians, attend the sad tolling of the Cloister Bells. A Star among us has faded. 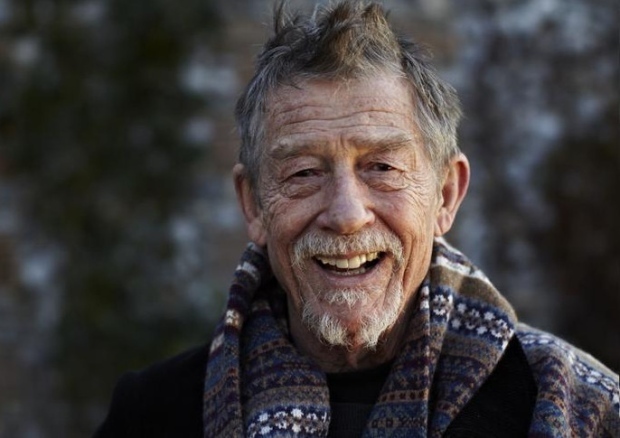 Sir John Hurt well deserved the Knighthood bestowed upon him. And whether he realized it or not, he was more than deserving of the praise of the critics and the adoration of several fandoms. He was Ollivander, who sold Harry Potter his first wand. He was the War Doctor, who rejected his own title to save Creation itself. He was the Elephant Man, played in “I, Claudius,” and was quite possibly one of the greatest actors of several generations, and through all this, he remained a genuine and slightly shy human being. I'm not going to talk about his career. I don't want to focus on the roles he has played or the awards he has won. Everyone else will replay a life of drama and glamour and success, but will overlook who Sir John Hurt was. If you want to know about his awards and roles and interviews, I suggest you take the Twelfth Doctor's advice and “Google it.” I'd like to make this particular memorial slightly more personal, and perhaps shed more light on the private, perhaps slightly shy man who was more than worthy of his fans' love. Last year, the Los Angeles Doctor Who convention “Gallifrey One” was honored to have Sir John as one of its headline guests. I think the organizers were quite stunned to have gotten a guest of his caliber, and were not quite sure how fans would react to him. But as always, Sir John proved to be one of the most popular of guests; he was friendly and inviting, and played along with the fans when they asked for posed photos with him. Fans said that he lit up the stage and the meet and greets, and clearly enjoyed meeting all of the fans. The morning of his main panels, he lightly teased his slightly awestruck and slightly more hung over interviewer. But perhaps the most touching moment came during one of his two Q&A sessions. A fan got up to ask a question, but once that fan was the sole focus of his idol, he lost the power of speech. As he fumbled for the words to ask his question, he muttered (completely forgetting about the microphone in front of him) “Jesus Christ, this is the closest I will ever come to an actual Knight....” As the audience laughed gently, Sir John invited the fan on stage with him, and the moderator told the fan to kneel. The fan knelt, and right there, in front of close to a thousand other fans, was “knighted” by Sir John Hurt. I have seen inspiring moments between actor and fan over the years, but I truly do not think I have ever seen a more glorious moment than those five minutes. 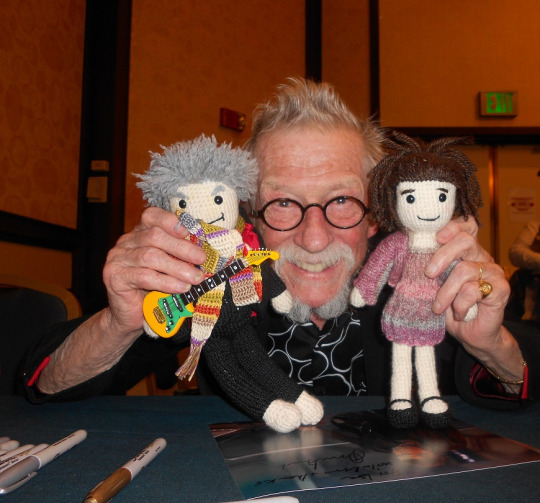 Attendees of the convention have posted their memories of their meetings with him, and in each one, there is a different story of an actor who may not have known quite what he was getting into, but ran with it and clearly enjoyed every minute. Photos and videos abound of the moment when he delivered several other Doctors' speeches, including both the First Doctor's farewell to his grand-daughter, and the Twelfth's passionate anti-war speech from the Zygon Inversion. He kept working until the end, with four films due for posthumous release. He inspired. He touched the lives of several fandoms. He kept his sense of humor even in the face of cancer and other illness. 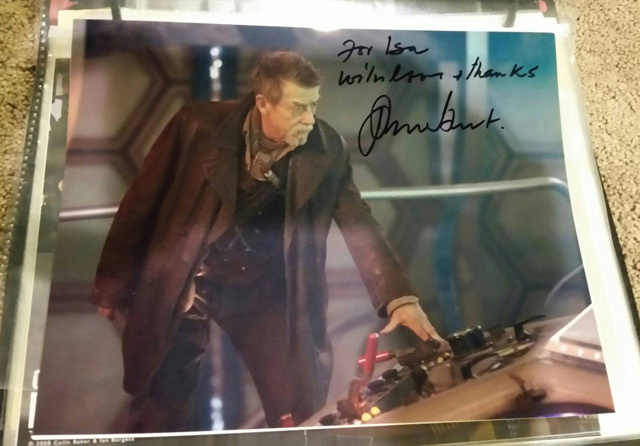 Sir John Hurt was a legend, and will remain so as long as we not only watch and preserve his performances, but for those of us who were lucky to meet him, we remember and share our memories of this extraordinary actor and humble man. Godspeed, Sir John, and may flights of angels sing thee to thy rest.